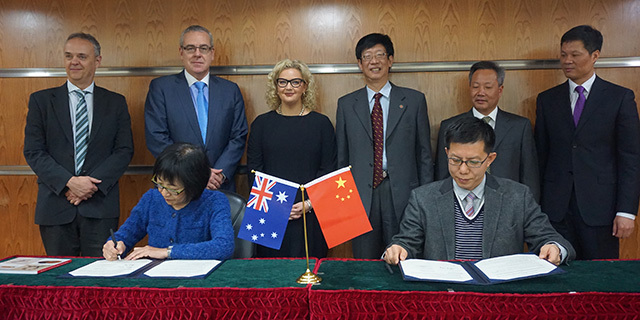 Professor Doris Young, Associate Dean China Programs recently accompanied the Victorian Government Minister for Health, Jill Hennessy on her first visit to Hangzhou in China, where the Minister attended a signing ceremony for a Memorandum of Understanding between the Faculty of Medicine, Dentistry & Health Sciences (MDHS) and Zhejiang University, School of Medicine. With a significant investment in fostering relationships to jointly solve global health challenges, this MoU provides a broad platform from which to enable greater collaboration in the areas of research higher degrees, joint symposia, student exchange and important research, particularly in the areas of neurosciences, infectious diseases and public health. This MoU complements the existing Student Exchange Agreement between the two universities developed in 2012, enabling five students from each institution to complete life-changing international studies per year. The Faculty of MDHS and Zhejiang University School of Medicine share strong similarities, with both being comprehensive research faculties of a similar size and background. They are both members of the Asia-Pacific Rim Universities Network (APRU) and are co-members of the Group of Eight (Go8) – China 9 (C9) relationship.